iOS 8 Beta Adoption Was Slower Than iOS 7 Beta - A Sign Of Things To Come? As the world awaited the iOS 8 release with bated breath, we at InMobi did some gearing up of our own. 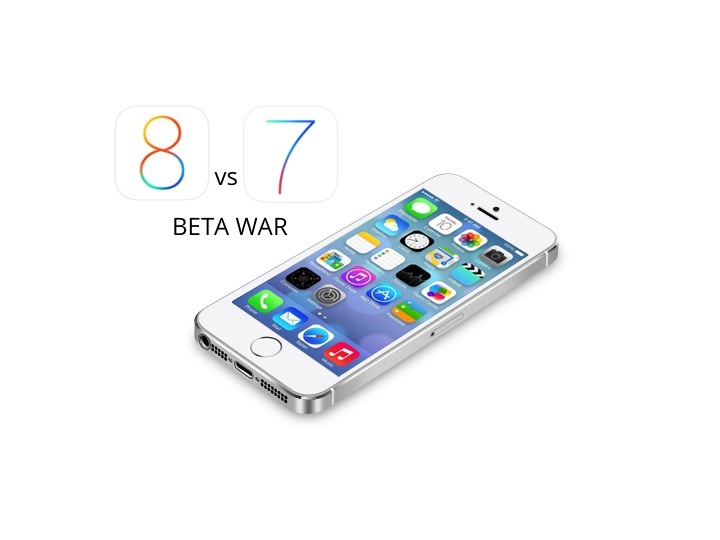 We analysed the iOS 8 beta adoption amongst developers who have access to the beta version of the release to see how it fared against iOS 7 beta adoption. Our research shows that Chinese developers seem to be building upon their success with iOS 7 by adopting iOS 8 faster. 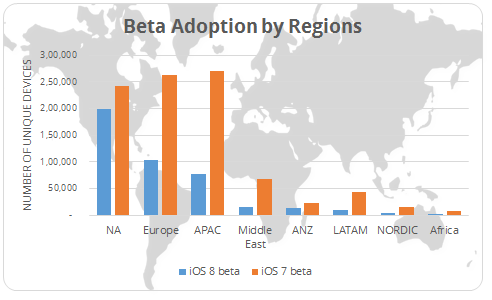 China is the only country among the larger developer nations to have registered a higher iOS 8 beta adoption compared to iOS 7 beta. An analysis of unique devices running iOS 8 beta on the InMobi network between July 1st and July 31st shows that the response to iOS 8 beta globally has been less enthusiastic compared to iOS 7 beta. This in turn is likely to reflect in fewer iOS 8 app releases on the app store in the first few weeks of general availability of iOS 8. In absolute terms, North America leads the way with 196K unique devices running iOS 8 beta showing up on the InMobi network. Europe and APAC rank second and third respectively. 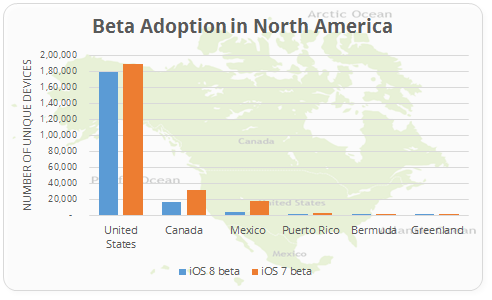 As a region, North America came closest to matching iOS 7 beta adoption numbers - iOS 8 beta adoption numbers were close to 80% of iOS 7 beta numbers. Chinese developers seem to be on a high, post their success with iOS 7 apps. China is the largest iOS 8 beta adopter in Asia and the second largest around the world with 39K unique devices on the InMobi network. 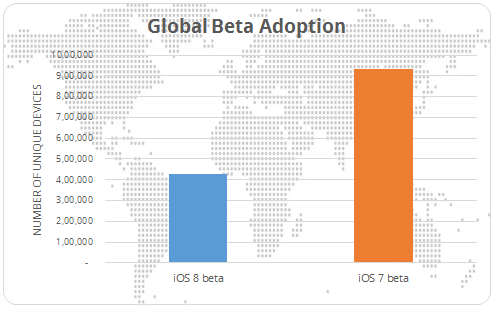 It is also amongst the few nations where iOS 8 beta adoption is higher than that of iOS 7 beta. Subsequently, consumers can expect a larger number of apps from China hitting the app store once the production version of iOS 8 is available. U.S. once again tops the beta adoption charts with 90% of NA market share and 42% of the global share of iOS 8 beta adoptions. This is representative of the 60% OS share that iOS holds in the country. With a dominant share of the OS market, developers are more likely to reach their local audience through iOS. Europe ranks second with a fragmented market led by France, followed by U.K. and Germany. Apple is a European favorite. 630,000 European jobs were created at Apple and at developers and business supported by Apple. This outranks Apple’s contribution to any other region of the world including the U.S. Nonetheless, European developers are yet to adopt iOS 8 beta at a similar scale witnessed by iOS 7 beta. 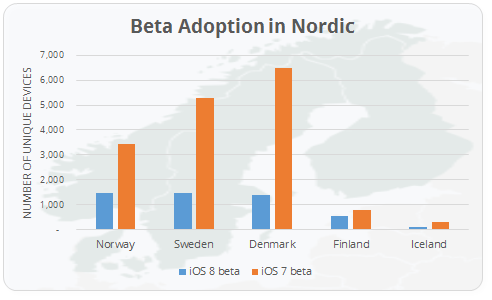 Surprisingly, the Nordic developer community has been slow in adopting iOS 8 beta. Being home to several big game developers, we were hoping for some hectic new development! However, with iOS 8 beta developer adoption at 30% of iOS 7 beta adoption, we hope that as consumers adopt iOS 8, so will the developers. Recently, we had the opportunity to interact with a large number of Chinese developers at our developer roadshow in Chengdu, China. With photos of Bill Gates and Elon Musk gracing their walls, their enthusiasm and drive was contagious. Their aim – to be the next big name in the Mobile industry, gracing someone else’s wall. With iOS 8, their dreams might just come true. For the rest of the world, is the slower adoption of iOS 8 beta a sign of things to come for the real thing? Note: Data for this study was sourced from the InMobi network for the period of July 2014 for iOS 8 and July 2013 for iOS 7.